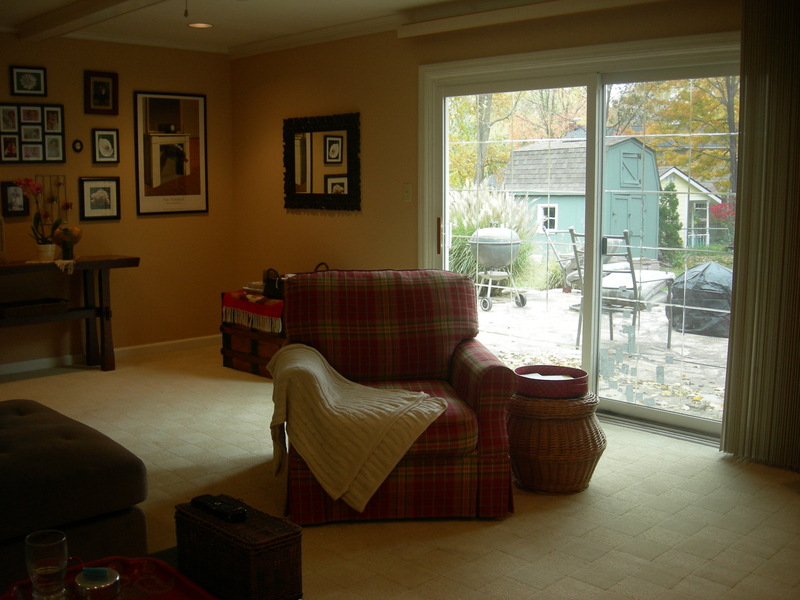 When I posted the picture of the outside of our house, I had a couple of requests for more pictures of the inside. Well, your wish is my command! I’m hoping to add more topics to the blog so stay tuned. I hope you enjoy! 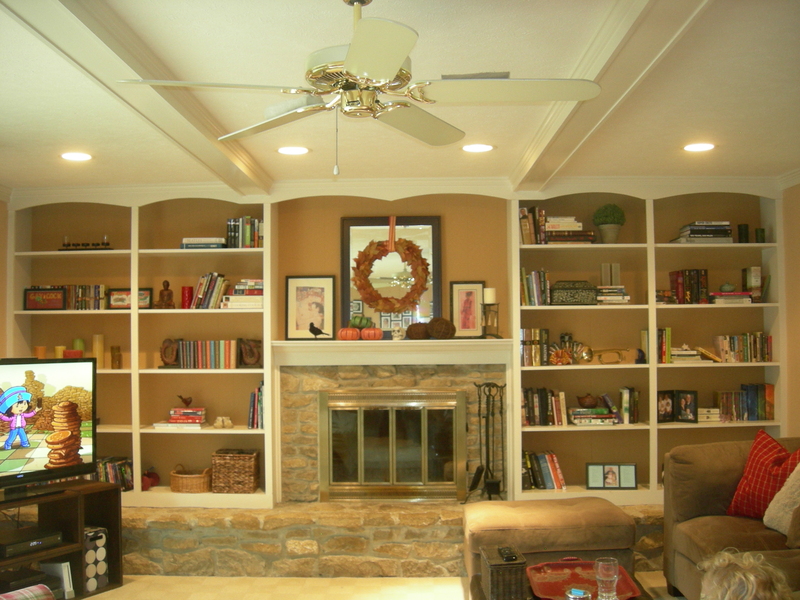 Our house is a tri-level with a large Family Room that is on the lowest level. 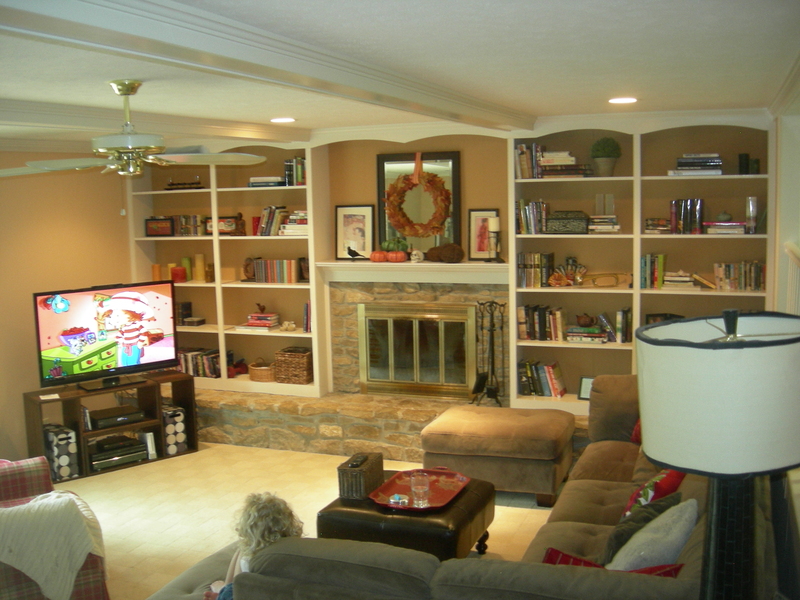 The Family Room was one of the BIG reasons we fell in love with the house. 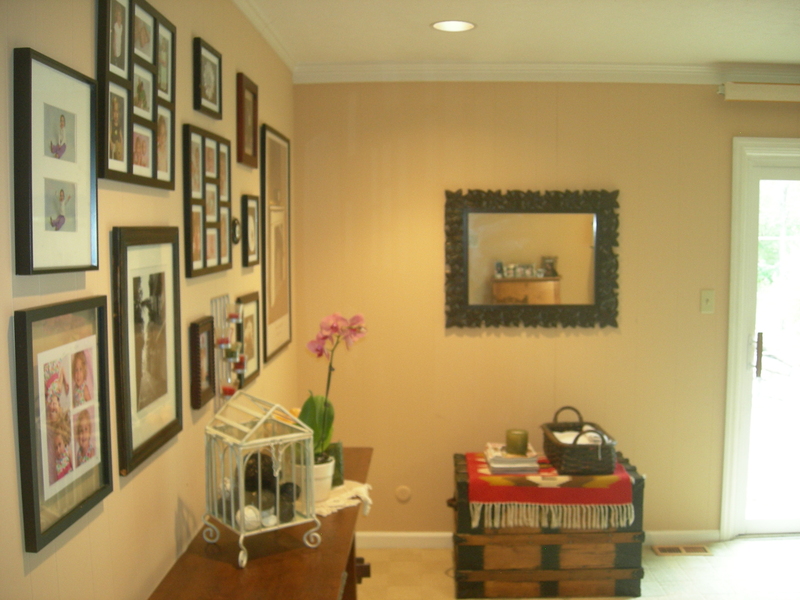 I wanted this room to feel really warm and inviting, and reflect our family in its’ decorations. Here is the other side of the room from the staircase. The Gallery Wall was somewhat of a nightmare. I wanted it to be all perfect and such but it actually looks cuter a little more naturally placed. I found some decorative balls at Target to put in the birdcagey thing (a leftover from my wedding). I just got the orchid for $9 at the Home Depot. 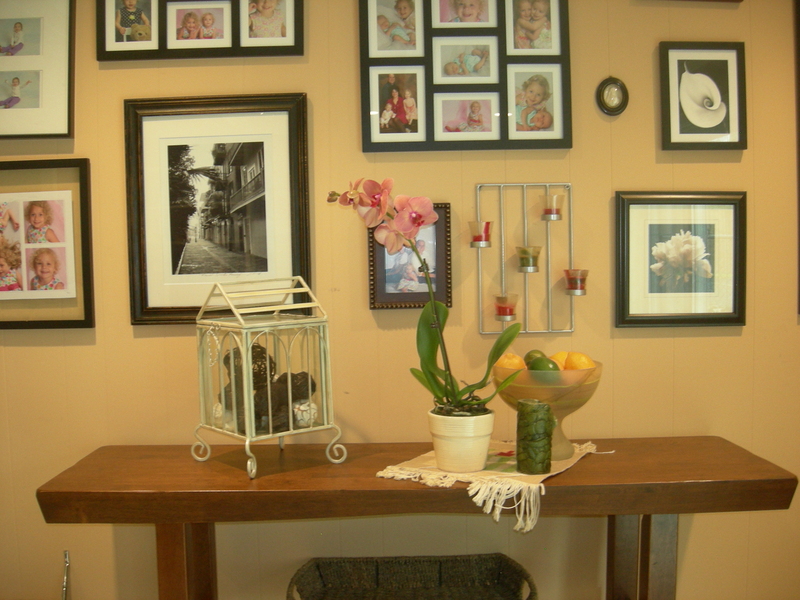 I’ve always wanted to try having an orchid but was afraid of killing it and spending a bajillion dollars on a plant. But $9 is totally worth a try. I think it really accents the wall beautifully. The first thing I did in the room was to decorate the bookcases using our own knickknacks and positioning the books in what I thought would make it look more interesting. A wonderful chair that my mom brought me as a gift from her house. It is so cozy and warm, I’m so excited that I’m able to use my basket as a side table. 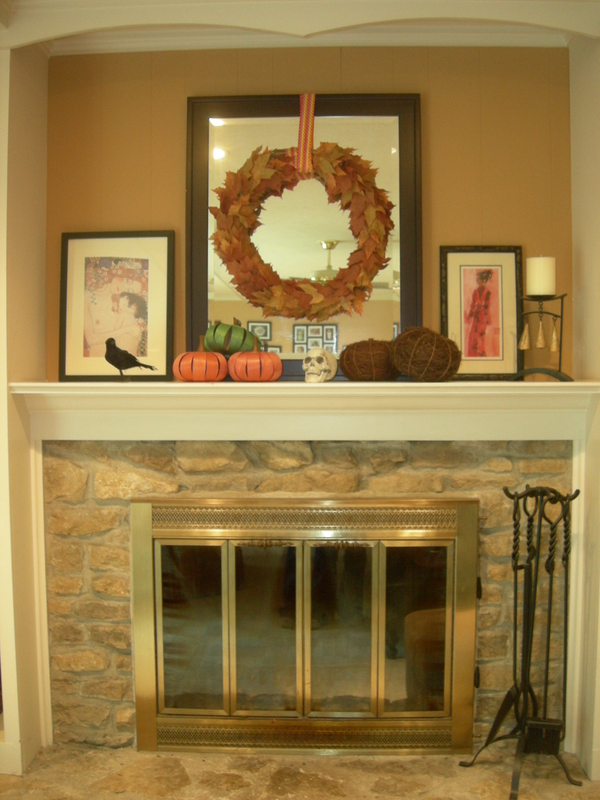 Closeup of the mantel – all my updates for $15. 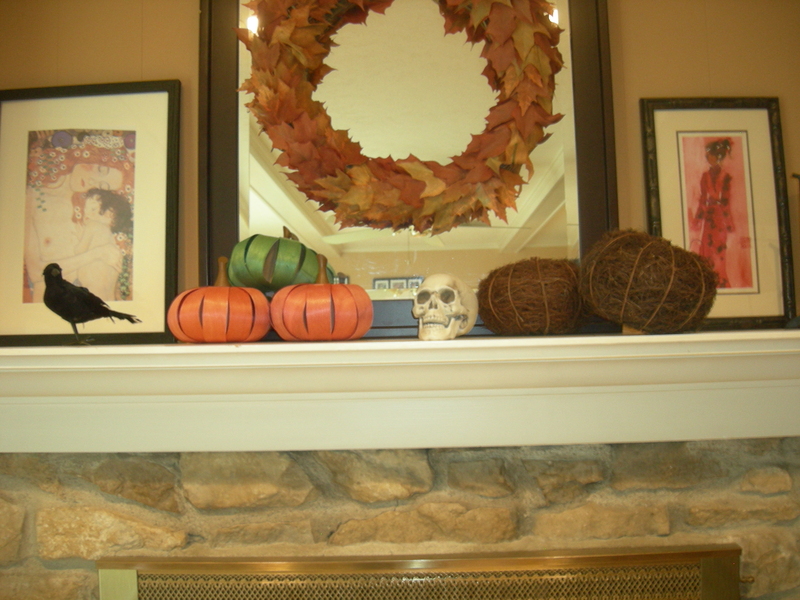 I wanted to decorate the mantel for Fall AND Halloween so I chose some things that could work for the holiday but that I could easily replace when Halloween was over. The pumpkins were purchased at Target ($2.50 each) and the raven and skull are from Dollar Tree. The wreath is my own from long ago tied onto the mirror using the picture wire from the back (in case you wondered how that was done 😉 ). There you go, room #1 in the house tour. As we finish more rooms, I will be putting them up on the blog. Thanks for checking it out.